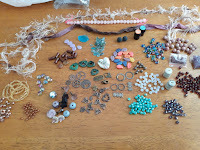 Just to recap, these are the beads I gave (left) and received (right) from my partner Lori Jean Poppe. There was so much to work with I hardly knew where to begin! But I did get four pieces done and several more are designed and ready to be made. I made two pairs of earrings and two necklaces thus far. I would have gotten started on more, but my hours at work increased over the past month and it's been a rough adjustment. Anywho, ON TO THE PICTURES! 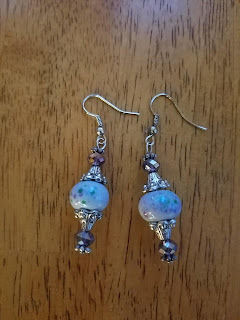 These were the first earrings I made. 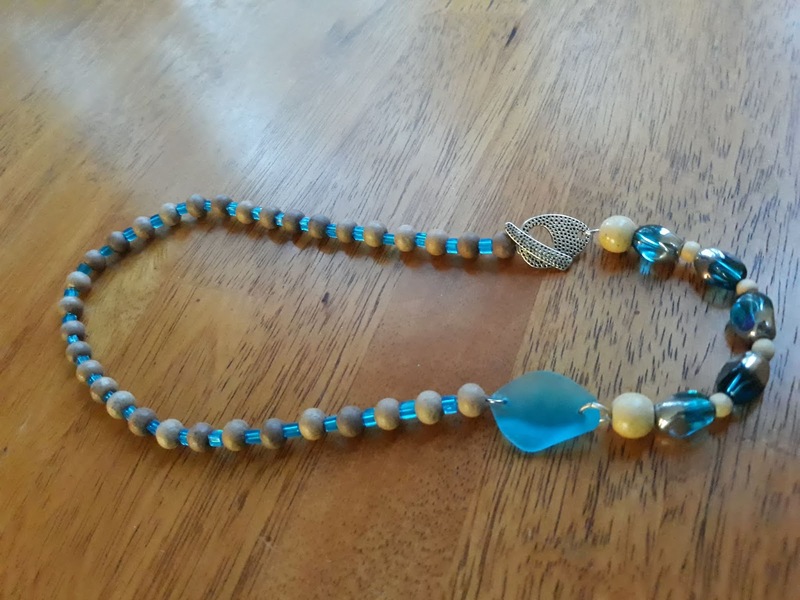 I really wanted to showcase the gorgeous glass beads Lori gave me. 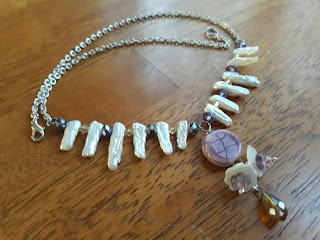 I used silver cones, as well as some silver spacers on the ends from my own stash. I love these earrings! 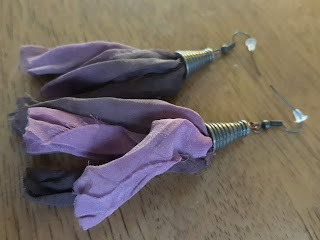 I had never made tassels before, and wasn't sure I liked them. I used the pink/brown ribbon,brass cones and some wire to put these together. I've already gotten compliments on them. Last, but certainly not least, this final necklace. The only part of this not from the swap are the stick pearls and the chain. 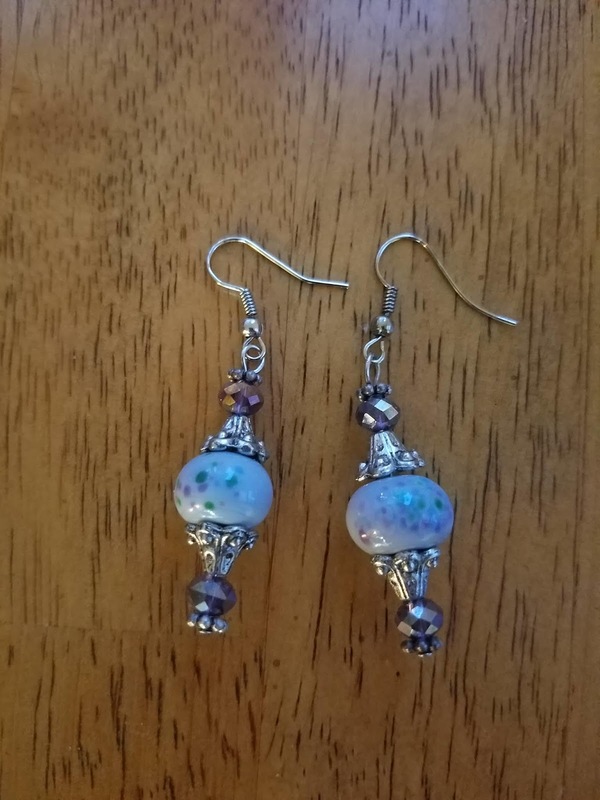 I used the purple rondelles and yellow bicones as spacers and made the focal from the glass bead, flowers and tear drop dangles. I really enjoy this piece. Designing it was a bit of guess work at times, but a random day off gave me the space and time to work out the colors properly. That's all from me for now. 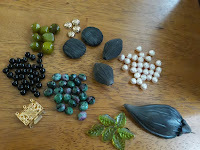 I will be posting these on Instagram, which I'm hoping will be a more convenient way to post jewelry. 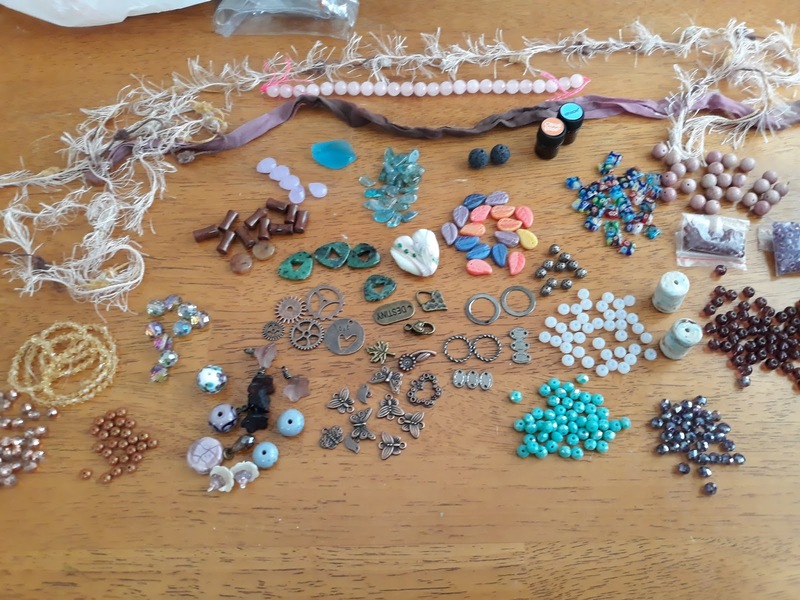 I will also post my completed WIPS these, such as a spring necklaces using the bird and butterfly charms, as well as some bracelet ideas. I hope you all enjoy the Hop and I look forward to seeing what y'all make! Well done, looking forward to seeing your WIPs completed as well. The pearl necklace is a stunner! Love pearls 💕 & your necklace! Looking forward to seeing the WIP pieces too! I'm glad you were able to eke in a little design time. All of your designs are pretty, but both of those earring pairs are really lovely. Love the earrings. And that necklace is beautiful with the pearls. I really love what you did with the bead I sent you. Very beautiful pieces and I really love both of the earring sets. Kristina - WOWZA! My faves are definitely the tassel earrings and the stick necklace. I love the classicness of the pearls. 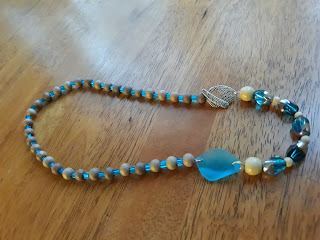 I'm also digging the blue necklace....I love a front clasp. ☺ Fantastic work! I love both the classic and whimsical earrings but the necklaces are my real favorites, especially the asymmetrical one - I love asymmetry and putting the clasp in front! Beautiful designs! I especially love the ribbon tassel earrings. I'm a twenty-something pagan with an affinity for tea things and hats. I live with my mother, elder sister, our lovely dog Roxy, and our three cats, Maurice, Sasha, and October. I'll be sharing my recipes and dreamboards, crafts and The Craft. Kickin' It Old Skool Blog-a-thon! Banglewood Crafts — Eat. Pray. Craft.